The last ship named USS Missouri is a floating museum anchored off Ford Island in Pearl Harbor. The fifth Virginia-class submarine will be named the USS Missouri, becoming the fifth craft in the Navy to be named in honor of the U.S. state, the Pentagon announced last week. 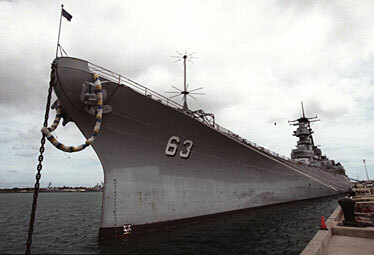 The last Missouri (BB 63), a battleship, saw action in World War II, Korean War, and the Gulf War. It is now a floating museum anchored off Ford Island in Pearl Harbor. The Pentagon also announced that two other Virginia-class subs will be named after the states of California and Mississippi. The nuclear submarine California will be the seventh craft to bear that name. There have been four previous ships named Mississippi. The first Mississippi, a side wheeler, served as Commodore Matthew Perry's flagship for his historic voyage to Japan and fought with Adm. David Farragut's forces on the Mississippi River during the Civil War. Pearl Harbor will get the three of the first four Virginia-class subs -- the USS Hawaii, Texas and North Carolina -- beginning sometime next year. The Pearl Harbor-based guided missile destroyer USS Chafee left Pearl Harbor last week to join the USS Nimitz Carrier Strike Group, and will operate in the western Pacific. The Chafee is commanded by Cmdr. Robert P. Tortora and has a crew of more than 350 officers and enlisted personnel. In September , the Chafee also was part of the Nimitz carrier strike group during a six-month deployment to the Persian Gulf and the western Pacific. Air Force Lt. Gen. Douglas M. Fraser -- commander of Alaskan Command, 11th Air Force, and Alaskan North American Defense Region -- will become the deputy commander of the U.S. Pacific Command at Camp Smith.